Let's continue with the part 2 of the post. A word of caution : This post may contain spoilers. If you wish to see the movie with a fresh mind, please discontinue reading further. 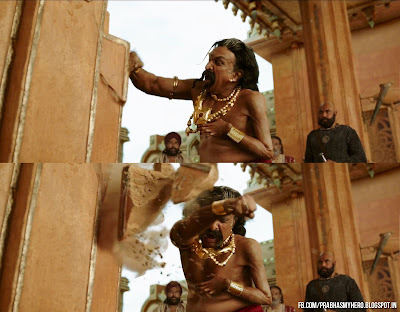 In this scene Rajamouli gives us a glimpse of the intensity of Bijjaladeva's strength in his disabled body. What was the reason behind this intense display of emotion? 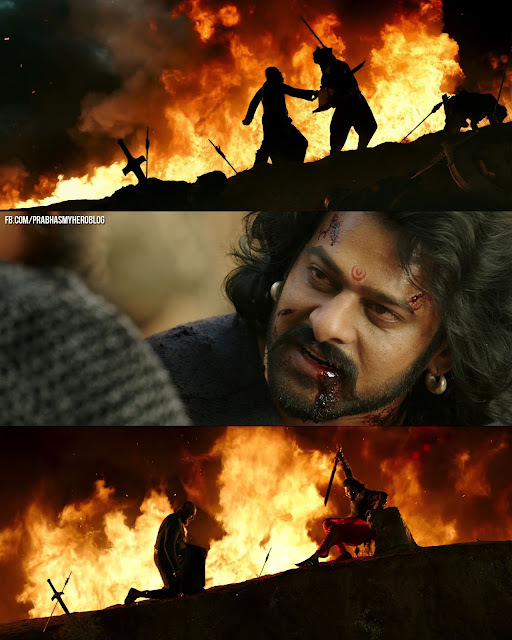 Going by his black hair of Bijjaladeva and a younger looking Kattappa in the background, it can well be assumed that this scene happens during Amarendra Baahubali's time. His reaction could well be out of his anger on knowing that Shivudu has escaped or that Sivagami has defected and cheated him and taken sides with Devasena. May be he was frustrated to the core that Sivagami has put him in a situation forcing him to do the inevitable ... to get her killed! Is Devasena welcomed in Mahishmathi? From this shot it can well be presumed that Devasena was not welcomed unanimously at Mahishmathi. It can also be reckoned that there is a change of guard in the Kingdom by the time Baahubali returns with Devasena. Now, why would Devasena be unwelcome in Mahishmathi? On seeing Devasena's costumes in the trailer it can well be assumed she was the princess of Kunthala, no less. Could there have been an enmity between Kunthala and Mahishmathi kingdoms? This view appears possible because during the war with the Kalakeyas in the first part, no help was sought by Mahishmathi from Kunthala kingdom, even though their army was considerably smaller than the Kalakeyas. Though this issue of seeking help from neighbouring kingdoms were never discussed in the movie, this possibility of Mahishmathi and Kunthala not being in good terms with each other cannot be ruled out. Thus Baahubali marrying a girl from an enemy kingdom was certainly unacceptable. It is also very likely that Baahubali's marriage with Devasena was the starting point of many conflicts Baahubali faced, including losing his crown to Bhallaladeva! The Coronation : Did it happen? This scene of a grand celebration at the Mahishmathi palace reveals that a big function, probably the coronation of Baahubali was going to take place. In the foreground we see a lot of performers with drums and in fanciful attire surrounded and flanked by the soldiers on all sides. We can see a grand line up of elephants on the left and the equestrian division on the right. The center of attraction is the grand pedestal flanked by horses in sandstone on top of which we can see a throne shielded by a huge umbrella. Inspite of such pomp and gathering something seems amiss. The whole crowd seems to be still as if waiting for someone. Now comes the big question. Did Baahubali attend the coronation? This question is laid to rest as in the opening of the Trailer we could hear Amarendra Baahubali taking his oath as the king of Mahismathi. But there well could have been some tense moments before the coronation. 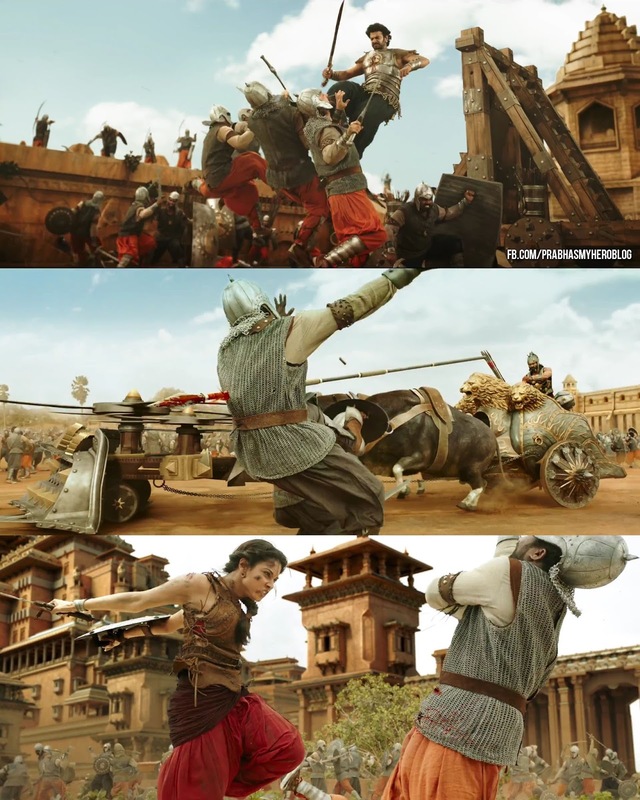 In this scene we can see that there are two factions within the Mahishmathi soldiers. Those owing allegiance to Bhallaladeva can be see in orange pants while those loyal to Baahubali are seen in black pants. Knowing this will definitely clear a lot of confusion in understanding who is attacking whom while watching the movie. The following shots from the trailer will make this more clearer. I suppose this is the scene when Mahendra Baahubali arrives attired in his father Amarendra Baahubali's body armour and is recognised and adored by the people of Mahishmathi. I am hearing people chanting Baahubali.. Baahubali.. (like the interval episode in part 1) with an awesome BGM by Keeravani. 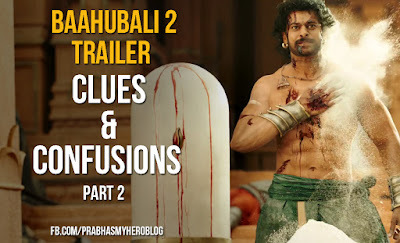 This is the most confusing part in the Trailer, especially the dialogue Baahubali says to Kattappa - 'Nuvvu na pakkana unnantha varaku nannu champe magaadu evaru puttaledu mama' (as long as you are by my side, no one man enough to kill me is born). Now why would Baahubali say this dialogue to Kattappa even though it was Kattappa who stabbed him? My guess is that this dialogue did not happen after Kattappa stabbed Baahubali, but in a different scene. Just compare the background in the 1st and 3rd screenshot with the 2nd screenshot. Unlike the fiery background in the other two, the background in the middle screen shot is plain without any sign of fire around and doesn't appear to occur in the night. But other than this i am not making any more guesses. If my hunch is right, then Bhallaladeva appearing as a silhouette with a larger than life shadow of him visible in the fire lit smoke might very well be part of this epic scene. This scene of a ferocious Bhallaladeva running menacingly with a broken Gatha's(Mace) is also hilarious (doesn't everyone like to see the villain lose! ), but what happened to the mace? Though the mace looks dented as if smashed onto something, a closer look shows that it is not dented but only half of the mace head is remaining and it looks as if the other half has been chopped off !!! If you wonder how could this be possible, recollect the fight scene of Kattappa with Aslam Khan in part 1 where Kattappa literally tears down a part of Aslam Khan's sword with his sword. Now imagine the power of such a sword in the hands of someone like Baahubali. Now it doesn't appear to be an improbable proposition, right? The final war between Mahendra Baahubali and Bhallaladeva will be a gripping sequence with some riveting action and emotional display of anger, hatred and revenge. What begins as a full fledged war between the forces of Bhallaladeva and Baahubali ends up as a one to one combat between the two. 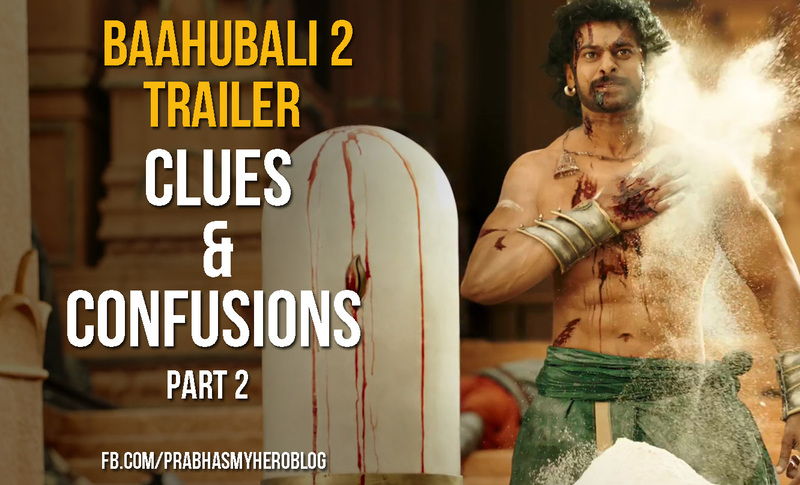 Here's Baahubali with his father's sword making the war cry. 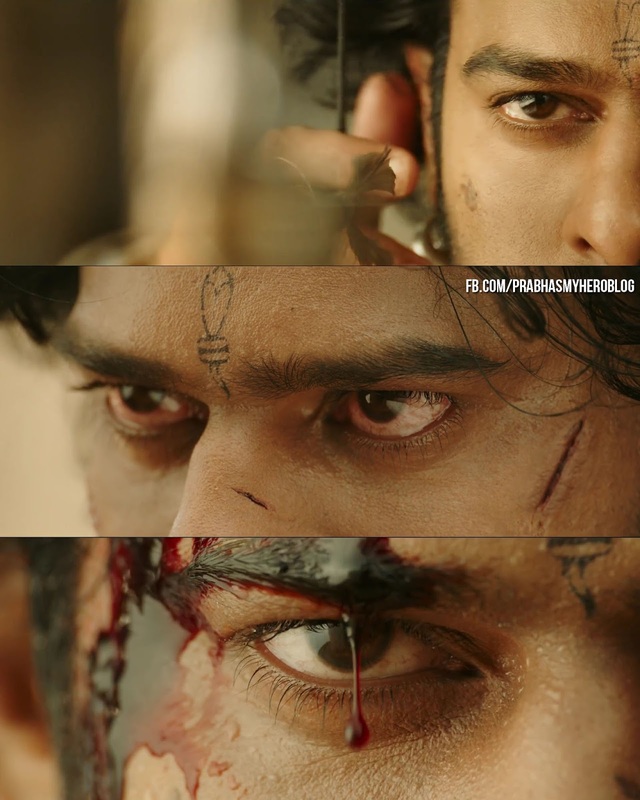 Before i conclude this post, here's the closeup shots of just Prabhas's eye from the Trailer. Enough to give goosebumps, right? Now that you have patiently read this long post, its time to relieve this magnificient trailer. Not only is the trailer very well made, its also cleverly done to entertain, exhilarate and to confuse you without you being even aware of it.